Despite the rumors to the contrary, the guitar remains the world's most popular instrument and for many people--from hobbyists to superstars--the guitar has been their gateway to a lifetime of musical enjoyment. So it's no wonder that many children want a guitar for their birthday or holiday gift. But with so many choices, how do you choose the right instrument? Epiphone, one of the world's oldest and most respected musical instrument manufacturers, offers a wide range of quality guitars at prices that are affordable to anyone. 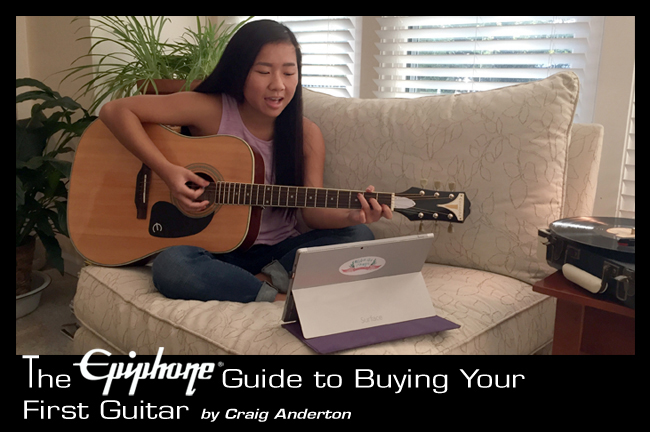 Here's what you need to know about buying a first guitar. Acoustic guitars are loud enough by themselves to entertain friends. Electric guitars require an amplifier, so you'll need to budget for an amp as well. There are two main acoustic guitars, nylon-string (used mostly for classical guitar music) and steel-string (the main choice for rock, pop, country, and folk). Nylon string guitars are a little easier to play initially because nylon strings are softer. But after a month or so of practice, the ease of playing is about the same. How Much Does a Good Guitar Cost? 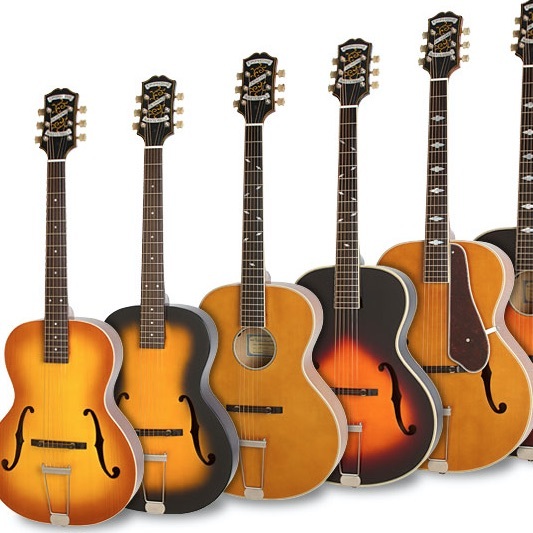 In addition to instruments used by professional players around the world, Epiphone offers both acoustic and electric instruments that are geared toward beginners for a little over $100. What's more, all Epiphone guitars are made with quality tonewoods and custom-designed hardware, and come with Epiphone's Limited Lifetime Warranty and 24/7/365 Gibson Customer Support. It's easier than ever to learn thanks to online web sites, instructional DVDs and books. Epiphone's beginner-oriented Player Packs include downloadable lessons from eMedia. 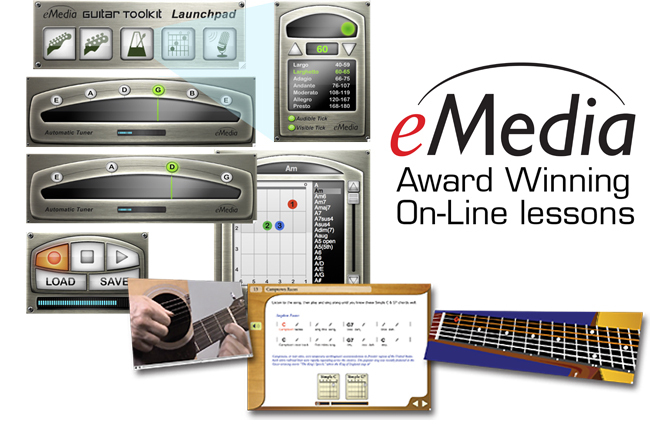 eMedia software includes powerful, interactive feedback that shows the notes being played in conventional music notation and also on an animated fretboard. This new technology tracks the player's progress to provide encouragement; it's also possible to slow down songs and exercises to make it easier to follow along. Even better, eMedia guitar lessons can be upgraded to cover more topics, and are available in English, French, Spanish and German. What Types of Guitars Does Epiphone Offer? Epiphone makes guitars for all musical styles, ages, and budgets. Here are some of Epiphone's most popular guitars; for information about additional Epiphone products, visit www.epiphone.com or your local Epiphone dealer. 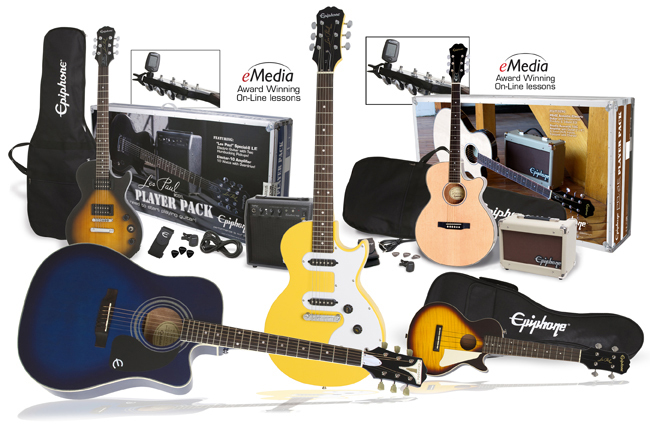 Epiphone Player Packs include everything needed to get started playing guitar at a very affordable price. Here are some of the most popular ones. 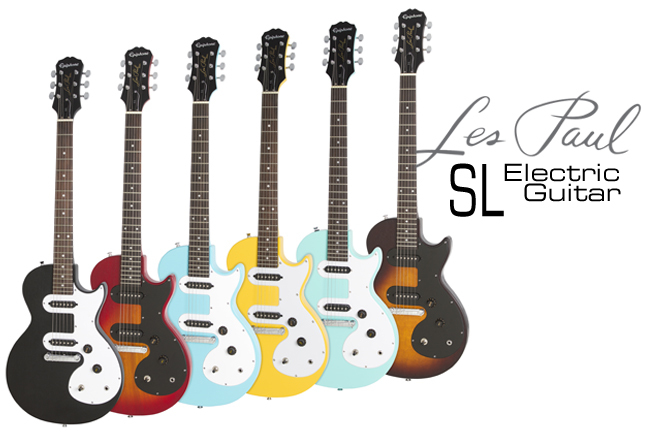 This affordable pack includes a Les Paul solid body electric guitar which has the same sound, look, and feel as Les Pauls played by many of the world's superstar guitarists. The Les Paul Player Pack also includes a 10-watt amplifier that can create the "clean" sounds favored by country and pop music as well as the "crunchy" sounds that power heavy rock music. It also includes a gigbag for carrying the guitar, a guitar strap, instrument cable to connect the guitar and amp, clip-on tuner, and picks. 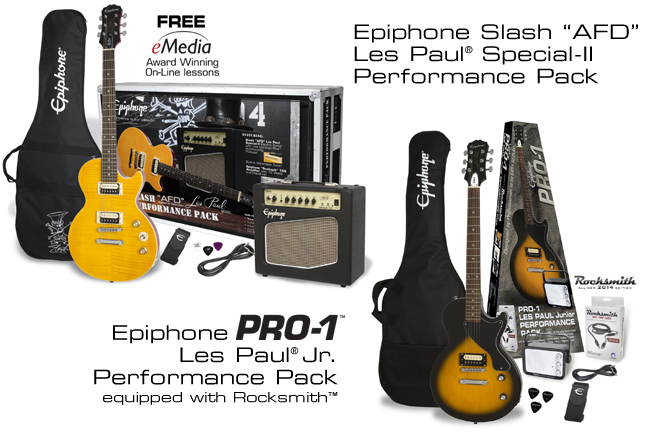 The Les Paul Player Pack also offers downloadable lessons from eMedia. Epiphone PR-4E Player Pack The PR-4E Player Pack includes an acoustic-electric guitar and amplifier designed specifically for acoustic guitar. 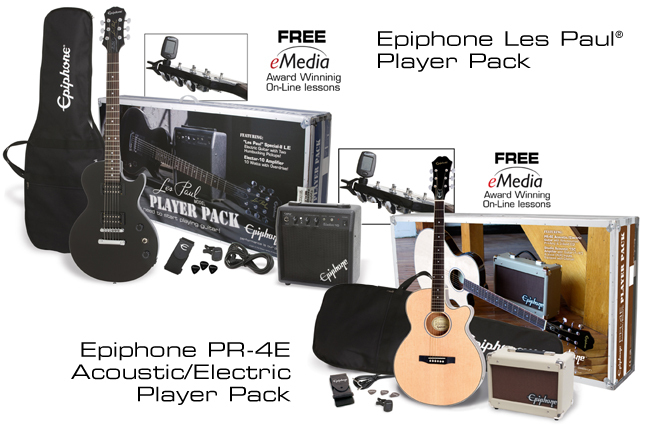 The PR-4E Player Pack offers the same accessories as the Les Paul Player Pack--including guitar strap, instrument cable, clip-on chromatic tuner, Epiphone picks, and free online lessons from eMedia. Epiphone PRO-1™ Les Paul Jr. Performance Pack equipped with Rocksmith™. This pack is the ideal choice for the serious student. It not only includes a Les Paul Jr. electric guitar, amplifier, and all the accessories found in other Player Packs, but includes Rocksmith™ software--the proven, fastest way to learn guitar. The pack also includes a Rocksmith Tone® Cable ($79 value) for connecting the guitar to a Mac or PC. Epiphone makes other Player Packs, such as the Epiphone Slash "AFD" Les Paul Special-II Performance Pack designed by Slash himself. It features a powerful 15 watt amp, premium gigbag, and a beautiful Appetite Amber finish. Although the Packs are a great way to get started, some children are ready to start with a specific instrument. 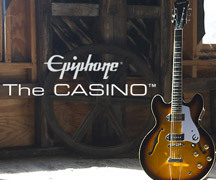 Again, Epiphone provides a variety of choices. The ukulele has become a popular "starter" instrument that keeps its appeal, even if the player ends up 'graduating' to guitar. 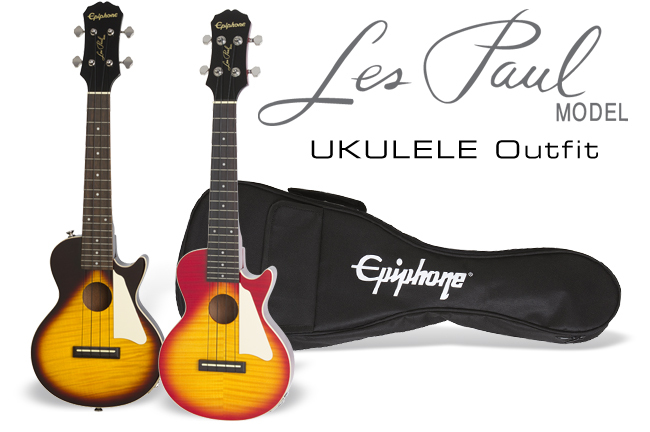 The nylon-string Les Paul Ukulele has the same visual appeal as the iconic Les Paul guitar, but is a full-featured, high-quality ukulele that includes a pickup so it can be amplified (amplifier not included). 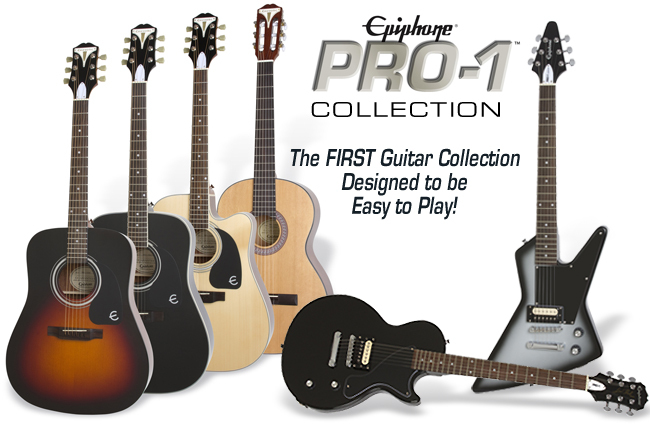 The PRO-1 Collection has revolutionized how people learn guitar. The PRO-1 Collection was created with the simple goal of designing a guitar that was easy to play, but still adhered to Epiphone's century-long tradition of making guitars with superb build quality, vibrant tone, and beautiful style. The EZ-Profile neck means less hand fatigue, JumboPRO™ frets let strings contact the frets with less pressure, and a shorter scale combined with Epiphone Light Gauge strings means less string tension for easier playing. The series includes three nylon-string classical acoustic guitars, and three steel-string acoustic guitars. PRO-1 Classic 3/4 Size. This 3/4 size classical guitar with nylon strings is the perfect choice for future child prodigies. Not only does it have the easy-to-play features of all PRO-1 guitars, but the smaller, 3/4 size fits smaller hands and bodies with ease. PRO-1 Classic Acoustic. Modeled after the world's top classical guitars, the PRO-1 Classic Acoustic features a Solid Spruce Top. The PRO-1 Spanish Classic has slightly wider-spaced nylon strings favored by Spanish Flamenco guitar players. 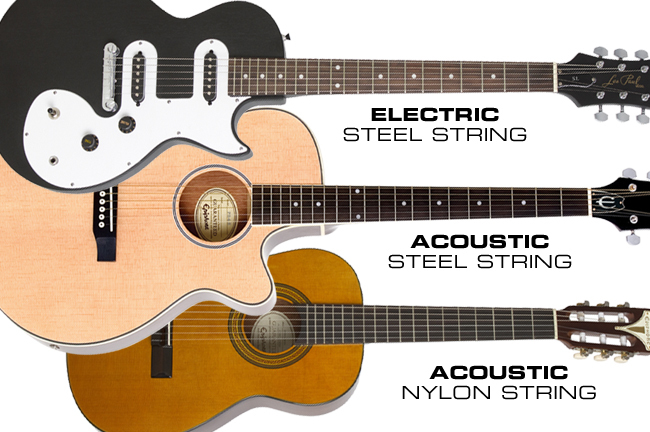 The PRO-1 Acoustic Series consists of three steel-string guitars, the PRO-1 Acoustic, PRO-1 Plus Acoustic, and PRO-1 Ultra Acoustic/Electric. The PRO-1 Acoustic is the simplest and least expensive of the three, and is an excellent choice for beginners. The PRO-1 Plus Acoustic adds a Solid Spruce Top that will sound even better as it ages, and the PRO-1 Ultra adds a pickup so it can be amplified, along with a compact control panel for tone and volume that complements the electronics. Without a doubt, this guitar represents the best value available today in a solid-body electric guitar. It features the iconic Les Paul shape with two powerful pickups, quality tonewoods, and a choice of body finishes that look as good as the guitar sounds: Sunset Yellow, Pacific Blue, Ebony, Heritage Cherry Sunburst, and Vintage Sunburst. This guitar isn't just a great starter guitar, but a stellar start to a guitar collection. These guitars have been selected because they are ideal for children starting out with a passion for guitar, but Epiphone makes guitars for all levels and players. We invite you to visit your Authorized Epiphone dealer to experience what makes these guitars special, and to have your questions answered about what guitar will make the best gift for your child--and introduce him or her to the joy of making music.